Jil Sander will launch Ultrasense White, a new fragrance for men. Ultrasense White is a flanker to 2013's Ultrasense. Confident by nature, this man has an aura, an intuition that guides him. Subtle colours, sharp lines and precise cuts – his guise is elegantly understated, yet it maximizes his innate appeal. An aura of quiet strength surrounds him like his signature fragrance. Quiet strength is the essence of JIL SANDER ULTRASENSE WHITE. It is a compelling combination of purity and intensity, a wild musk enhanced by vibrant bergamot and virile wood. In the top note, bergamot, saffron and violet leaves stimulate the senses with their subtle contrasts, already hinting at hidden depths. In the heart, rich cedarwood is a forceful, masculine presence, softened by the smooth, warm scent of tonka bean. In the addictive dry-down, his signature is elegantly written in white musk, to which amber adds a touch of mystery. Ultrasense White was developed by perfumer Olivier Pescheux, who also did the original Ultrasense. 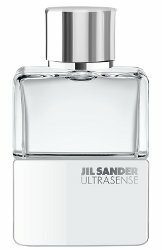 Jil Sander Ultrasense White will be available in 60 and 100 ml Eau de Toilette. Are clear white fragrances and packaging the new Oud for men? We have two in two days – the one yesterday and this one above. If there’s one tomorrow or Monday that will make a trend. I can’t believe there are still Tonka beans left. Seriously, you’d think tonka beans would be as endangered as sandalwood.